This is Card #3 - I actually featured this one over at the Lawnscaping Challenge Blog - so if you haven't checked that out yet - be sure to click the link and it will take you directly to it. 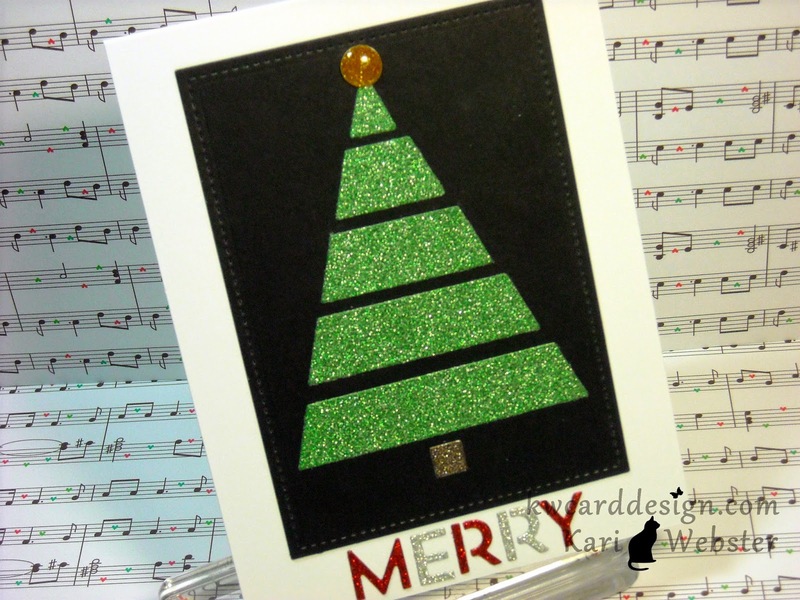 I used a Simon Says Stamp/Lawn Fawn Exclusive for this card. This stamp set was part of the Stamptember Celebration over at Simon Says Stamp. Love these birds!! 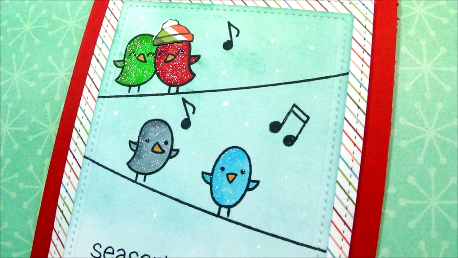 I used one of my newest sets that I purchased a few weeks back from Clearly Besotted Stamps called Hangin Around. It is a set I knew I had to get, because it screamed enamel dots to me!! And, as you can see that is exactly how I used it. I have both videos below if you'd like to check them out!! 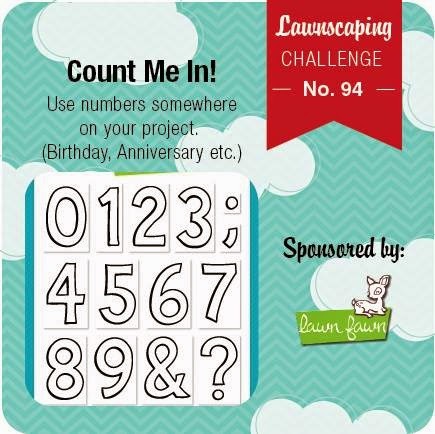 Thanks for stopping in, and I will be back tomorrow to share a new Lawnscaping Challenge with you!! Till then! Welcome back! Today my card is pulling double duty! 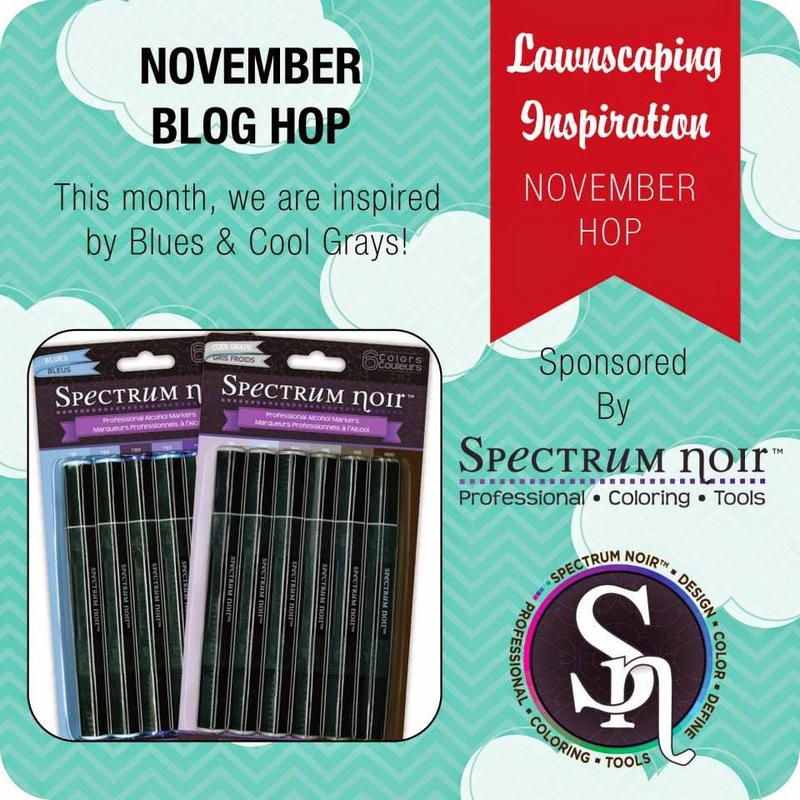 The newest challenge for Lawnscaping is up! 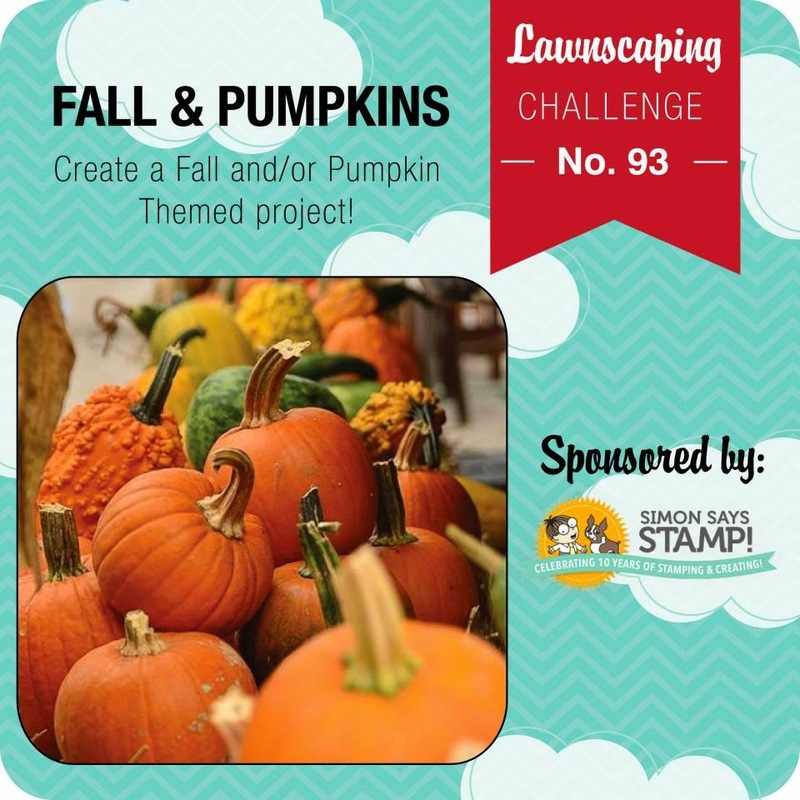 It is all about Fall/or Pumpkin themed projects. 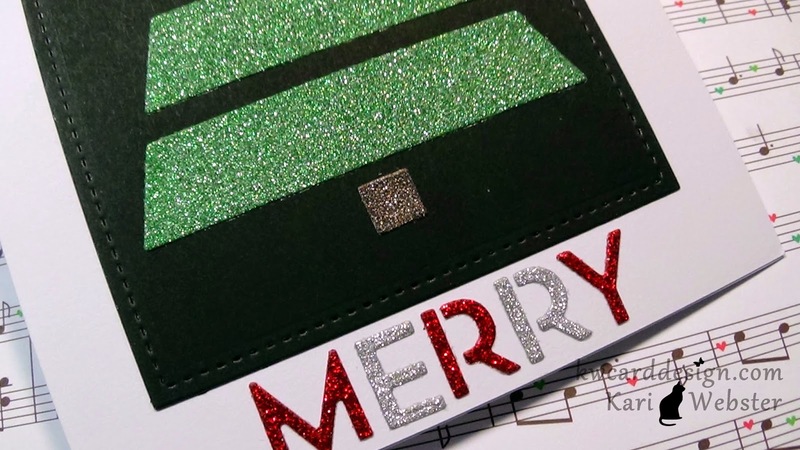 This is also Card #2 in my Holiday Card Series for 2014. Before I get down to details, I must give a shout out to our wonderful sponsor Simon Says Stamp! For the winner of this challenge - they will get a $25 dollar gift certificate to spend how ever you'd like in their online store! So I used some of my favorites for this card! 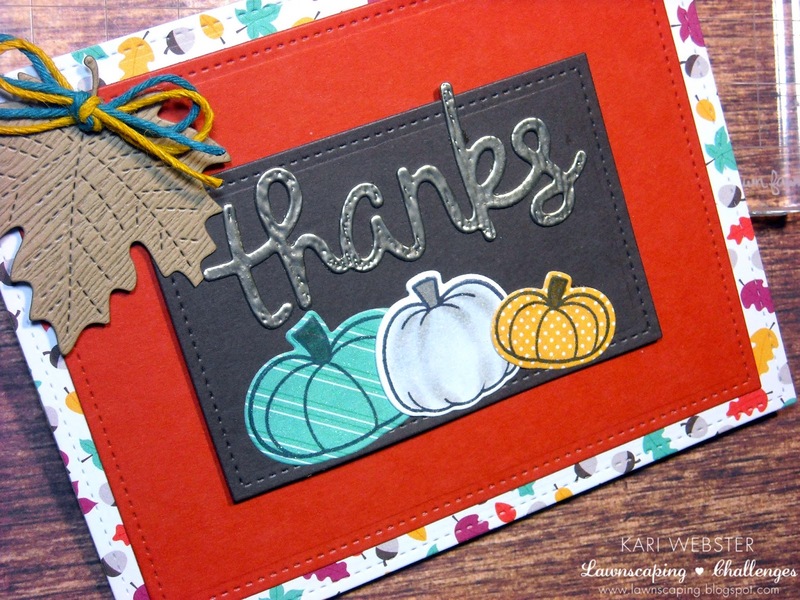 I used the So Thankful set along with the matching dies as well as the pumpkin from Spooktacular. I stamped the So Thankful pumpkins on pattern papers from from the Sweater Weather 6x6 pad( LOVE THIS SO MUCH) using Memento Tuxedo Black Ink, and I stamped the pumpkin from Spooktacular with the same ink, but removed the ink from the eyes and mouth, and stamped it down on to white card stock. I added some dimension with a W-3 Copic Markers as well as a C1 Copic Marker to give the look of a white pumpkin. Once all of my pumpkins were stamped and die cut out, I die cut my framed pieces from the same 6x6 pad, as well as some colored card stock. I also die cut the largest leaf from the Stitched Leaves die set from Lawn Fawn as well as the Thanks from the Thanks die also from Lawn Fawn, and used some Wood grain Card stock from SSS. 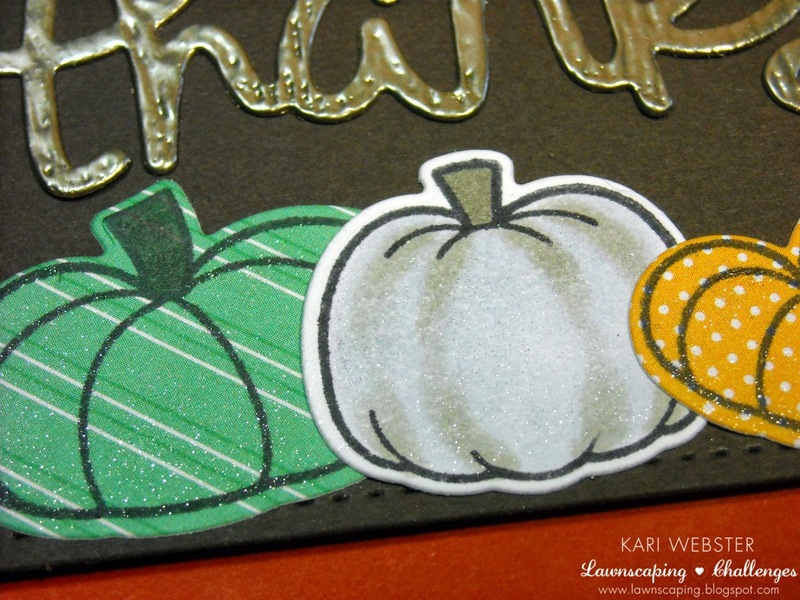 I wanted to emboss my Thanks die cut, so I applied some Versa Mark ink and sprinkled on on Pewter Embossing Powder, and heat to set. I assembled all of my pieces to my card, and once I was finished, I added some Lawn Trimmings to my leaf as well as some Wink of Stella to my pumpkins. To see how I put it all together - my video is below! Thanks so much for watching and reading, and I will be back for Card #3 of my Holiday Card Series soon!! Have a great week! I have my winners for the Craft Prize Pack and the $25 Gift Certificate to Butterfly Reflections, Inc.
Shelle - Gift Certificate Winner! CoGRatULatIOns!!!! I have emailed you both! Thank you to ALLL of you for entering into my giveaway! I am touched at the response! REALLY! I hope to do another giveaway soon!! Hello everyone! So - I've done something I haven't done in months! I decided to participate in a challenge!! No DT projects, just play time! The newest Mama Elephant Challenge is up for November, and I was inspired. I love Mama Elephant stamps and dies, and I bought the set Winter Wonderland last year, but by the time I was able to get my hands on it, the holidays were over. This set was super popular, and it was constantly sold out. So, I decided to ink it up, and let the creative juices flow. I actually love the end result if I do say so myself! That is the wonderful thing about creativity - I had NO idea where I was going, and I just looked in my supplies, and once I picked out my dies from Lawn Fawn, then I just sat down, and came up with this card. I die cut the Stitched Banner dies from Lawn Fawn out of some PTI Stampers Select White card stock. I die cut both dies at the same time on my white card stock, and created a larger border piece and then the inner piece. I then started to ink up the outer frame with Iced Spruce Distress Ink, then I moved on to my inner piece. I punched out a circle with my 1 1/4 circle punch to make a moon mask, and then added the Iced Spruce, Tumbled Glass and Chipped Sapphire Distress Inks.. I love the gradient look that came out of this. Then I stamped in VersaFine Onyx Black Ink the birch trees and little deer. 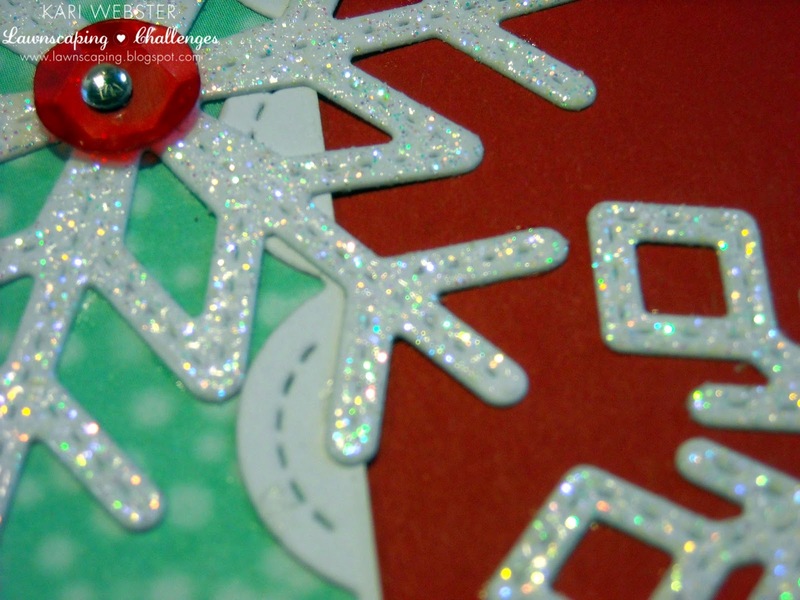 I then stamped the star images in VersaMark Ink and embossed in silver embossing powder as well as my sentiment. I also made a border piece from a scrap piece of card stock to match the same silver. 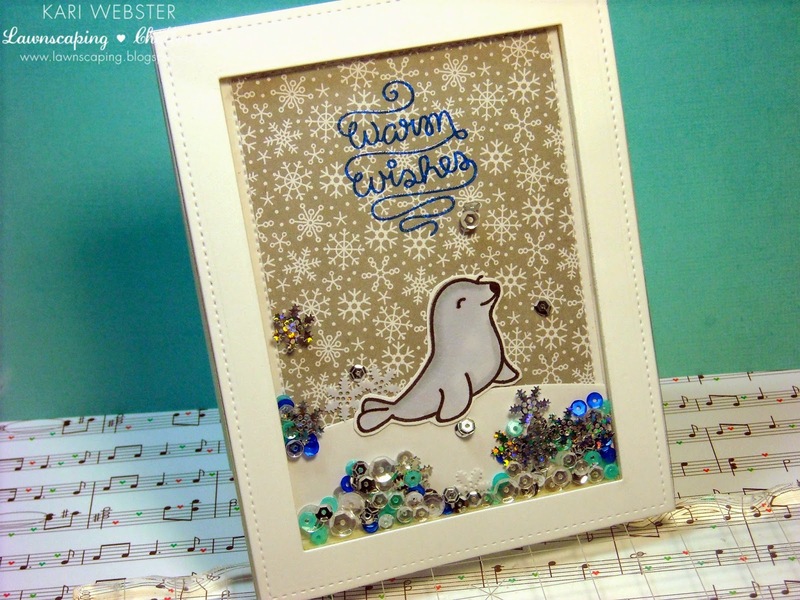 I started to assemble my card by choosing some solid blue paper from the Doodle Bug 6x6 Frosty Friends pad, and adhered my frame to it, and then adhered foam adhesive to my smaller panel for a little dimension. I adhered the whole panel to my Enchanted Evening card base, and then added my silver strip and some Hero Arts gems to finish things off. It was so fun to just play and explore what I could come up with for this challenge!! See you soon! Hello my fellow crafters!! 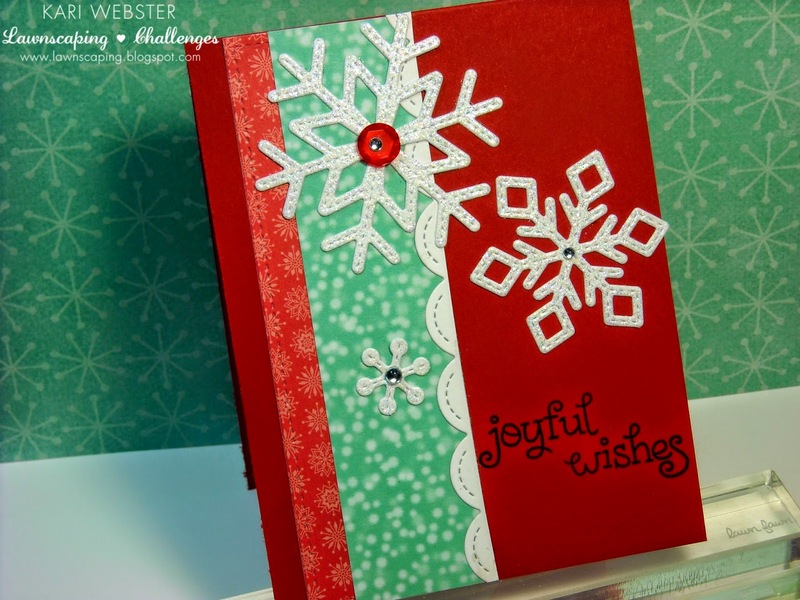 Welcome to card #1 in my Holiday Card Series for 2014!! This is my first series I've done, and first Holiday Card Series, so I hope you enjoy the cards I make and present to you, and I also hope to inspire you on what to make for your holiday cards this year!! 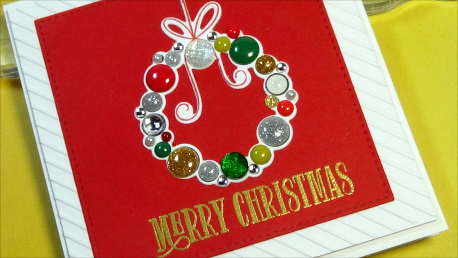 Today, we are using a great stamp set from The Stamps of Life called Ornaments4Christmas and its coordinating dies. 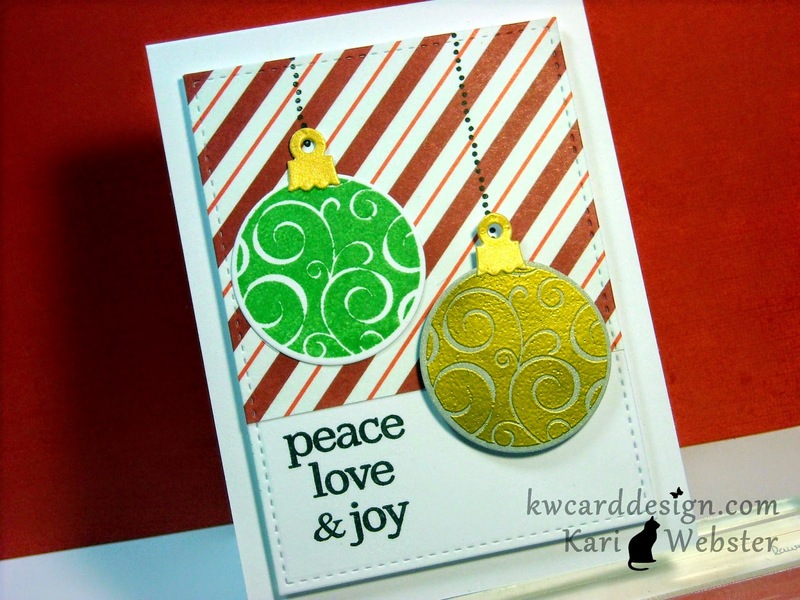 For the first ornament, I stamped it out in Fern Ink from Simon Says Stamp. I love this green color, such a pretty Kelly Green. 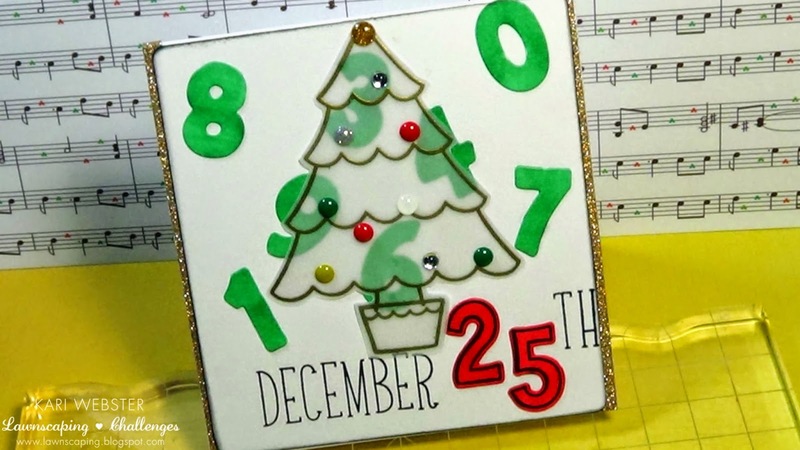 I then die cut that out with the matching die as well as the ornament topper. I took my Galaxy Gold Memento Ink Dew Drop and just swiped the pad across a piece of scrap white card stock, and let dry, and used the topper die to cut out. I then worked on the other ornament. I used a piece of silver shimmer paper from the Shimmer Stack from DCWV, and inked up my ornament in VersaMark Ink, and then applied some SU! 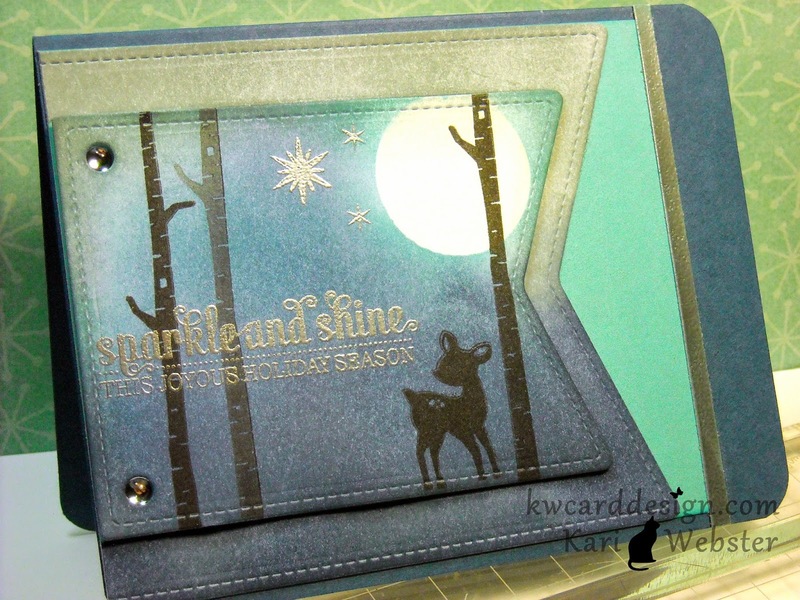 Gold Embossing Powder, and heat to set, and also die cut it out using the matching die. I then used a white panel that I had previously die cut from a another project using the stitched frame from Femme Frames from ME. I didn't use it before because it has gotten a smudge on it, so I set it aside. I didn't want to scrap it and waste it, so that is when I decided to use some pattern paper from the Oh, Deer 6x6 pad from Fancy Pants. I love this candy striped pattern, so I die cut it using the same stitched frame, and I adhered that pattern paper using my PLUS adhesive. I needed some "strings" for my ornaments so I decided to use the dotted stamp from Deck the Halls from Lawn Fawn and stamped those using my favorite black ink - VersaFine Onyx Black ink. I stamped my sentiment from the same SOL set also in the same black ink. 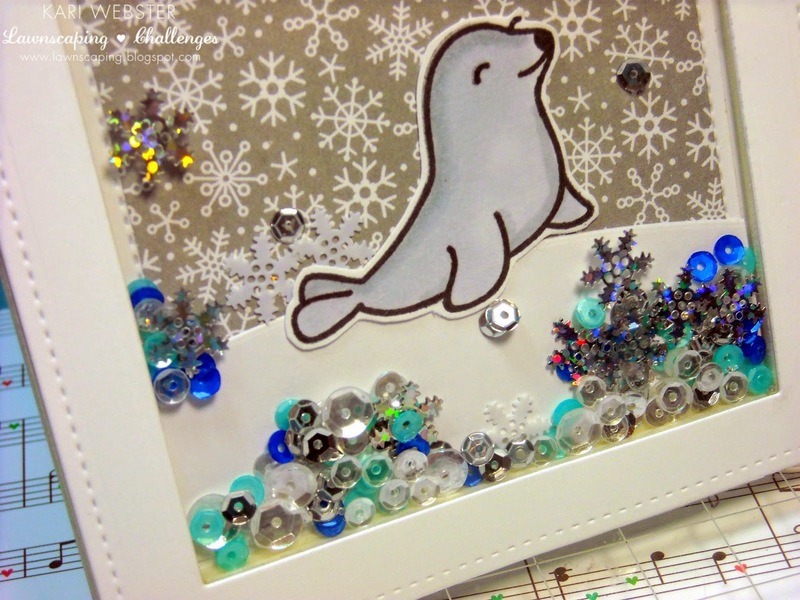 I added my ornaments to my card panel, and then added some foam squares to the panel to pop it up off of my white card base. Simple, and easy to replicate! 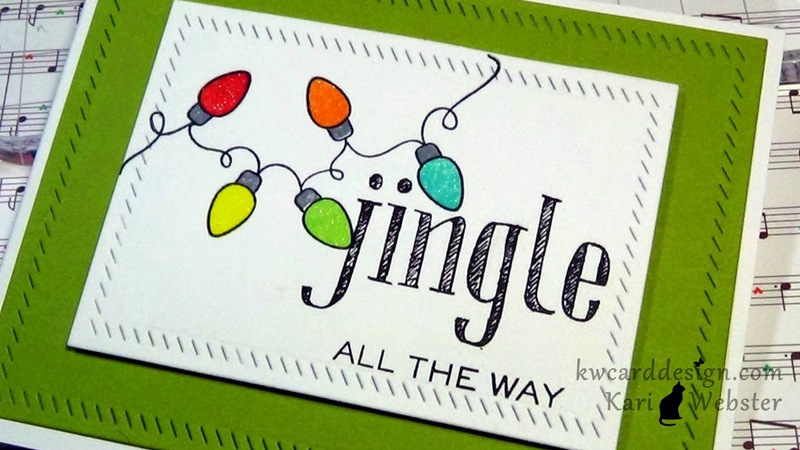 I think that's the name of the game when making Holiday Cards!! The video is below if you'd like how this one came together!! Thanks for stopping by, and I'll be back with Card #2 soon! !